Top 10 Science Fiction Disappointments Of The Past Decade, in part because I sympathize (not to say I've even seen all of these) -- but mostly because I can't resist this image. Top Ten Tech Stories for the Decade, because, well, I'm a computer guy as well as an SF enthusiast. 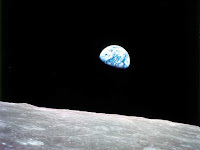 The Top 10 Science Stories of 2009 [Slide Show], from Scientific American. The 2009 Science Fiction Power List, is full of SFnal awesome. SFcrowsnest Fantasy, Horror and Science Fiction Books Chart, from across the pond (and, I'll modestly disclose, a book of mine is well-placed in the list). From National Geographic, Top Ten Space Finds of 2009: Nat Geo News's Most Viewed. From Space.com, 9 Astronomy Milestones in 2009. And finally, not exactly fitting the theme: Stars Find Fountain of Youth Via Vampirism and Collisions, because, really, how could anyone resist? At every con and book signing, and in every SFnal chat room, it seems that the craft of writing and the business of publishing eventually come up. There's a sort of symmetry in play: most writers are inveterate readers, and many readers aspire to be authors. So: I'm delighted to have been given the opportunity by WriterHouse to teach a weekend seminar on writing speculative fiction. The seminar will be held Saturday and Sunday, January 23-24, in lovely Charlottesville, VA.
Lovely isn't mere politeness -- among its charms, Charlottesville is home to Monticello and the University of Virginia, both legacies of Thomas Jefferson. 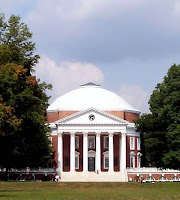 The image is of the UVa Rotunda, designed by Jefferson. WriterHouse is also hosting me the evening before (Friday, January 22nd) at a book signing and discussion open to the public. Health-wise, science must be doing something right. To know that, we need only look at trends in lifespan and at the once untreatable conditions that medicine can now address. And consider the many quality-of-life improvements, from prostheses to painkillers. Health science will only get better -- if public policy doesn't kill off R&D in the name of funding universal care. I knew this interview was pending on the popular book-review site Bookloons, but not exactly when the transcript would appear online. Today, as it happens. 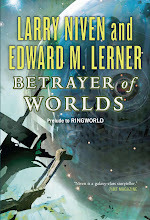 The interview ends with a sneak peek at my next books (probably 2010 releases), one a collaboration with Larry Niven and the second a Lerner solo. 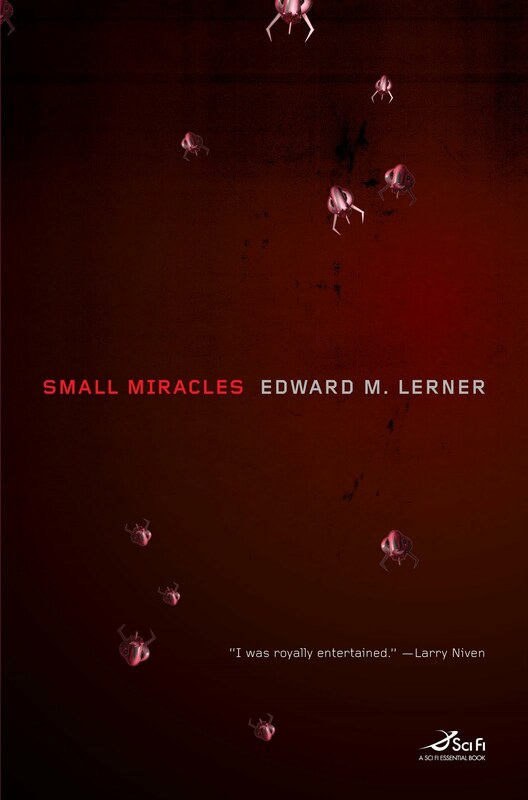 Bookloons also posted its review of the recently released Small Miracles, concluding: "I highly recommend Small Miracles to anyone interested in relatively near future SF, and in the fascinating possibilities of nanotechnology." Thanksgiving makes for a shortened work week (and yet here you are, surfing), and the turkey et. al. aren't going to eat themselves. November's theme at the Year of Science is chemistry. Good stuff, chemistry. You won't hear me complaining this month about wishy-washy, politically correct themes. This is science. And chemistry is the basis for indispensable technology. Think of DuPont (and countless others) bringing us Better Living through Chemistry. Where would we be -- no irony intended, if you should wonder -- sans (to name a few chemical products) preservatives, plastics, petrochemicals, and pesticides. I'm inspired to remember long-ago chemistry classes -- where I learned to respect the people who really could ascertain something in the lab. (Ever been given a mystery chemical and a few hours to identify it? I might have been given been a flask of phlogiston dioxide for all I know.) Identifying mystery chemicals takes real skill. But somehow the YoS people neglected to include Tom Lehrer singing the periodic table. Trust me: it's a hoot. The retconned video only makes it better. 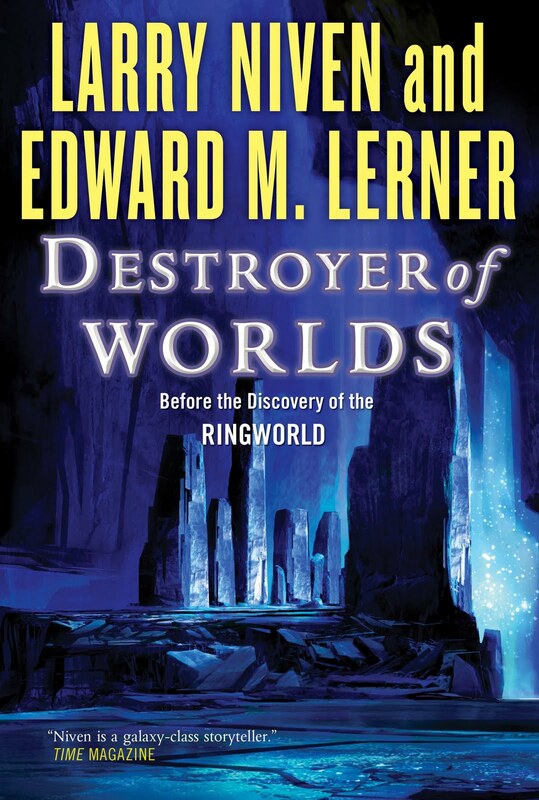 Destroyer of Worlds , released today, is a far-future space epic. 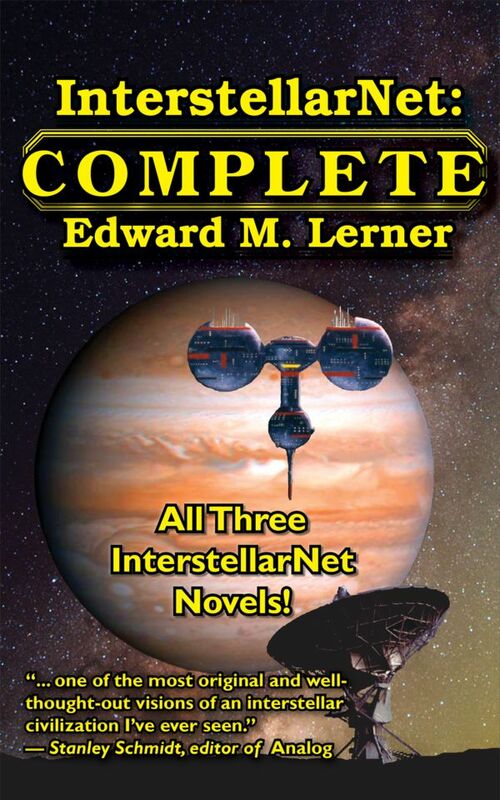 It's also my latest/third collaboration with Larry Niven -- all part of our Fleet of Worlds series. Destroyer, like our earlier books, deals with Puppeteer manipulations -- these aliens are aptly named for more than their appearance. And the afraid-of-everything Puppeteers have more than ever to fear, because on the horizon looms another, particularly scary, alien species: the Pak. (That brings us to our second cover snap [below the fold]. That's Earths, plural. Obviously Earth itself exists and can hardly be a trope. But what about the many Earthlike planets in SF? (How often does the starship Enterprise encounter a solar system without an "M class" planet or moon?) Are Earthlike worlds realistic or a trope? Our native solar system has but one Earth, of course. Real-life searches for extrasolar planets best spot large, massive, and close-to-their-primary objects. The observational methods are not yet sensitive enough to spot Earthlike planets (see current list of extrasolar planets here). IIRC, the smallest extrasolar planet yet found is about five Earth masses. There may be -- and presumably are -- other Earthlike planets, but searches to date say little yet about the prevalence of such planets. I spent much of last weekend at Capclave 2009. Capclave is the annual DC area SF con. I don't always make it, but this was my fifth time there. Like the dodo logo? That's the Capclave symbol, befitting their slogan, "Where reading is not extinct!" Capclave is a small, intimate con -- about 200 attendees in a typical year. It draws lots of local writers, including MAFIA. No one minds me calling a billion years an age, do they? Earth, the third rock from the sun (I loved that show), is ~4.6 billion years old, the sun a bit older. (Exact estimates vary, of course.) In that time, lots has happened. The sun grew about 30% hotter (and it's not done). The Earth cooled from the heat of collapse as it coalesced out of the primordial material of the pre-solar system. Oceans and atmosphere formed. Life emerged. In time, oxygen-producing life evolved and totally changed the atmosphere. Interesting things keep happening. Radioactive decay keeps the core hot and drives plate tectonics. Carbon-bearing rock disappears into the inter-plate subduction regions, and is returned to the atmosphere by volcanic eruptions. Continents drift, also driven by plate tectonics. There's erosion, and mountain building, and sedimentation. Ice ages come and go. Oh yeah: early in Earth's history, a Mars-sized object smashed into our planet, melted the top many miles of Earth's surface, and blasted enough stuff into space to re-coalesce as the moon. In short, Earth is a complicated place. Geoscience, this month's theme at the Year of Science, deals with this very complex amalgam of physics, biology, and chemistry. After I harped at the non-science of recent months' YoS themes, I'm happy to see a real science recognized this month. Check it out. And don't miss this six-minute video that introduces geoscience and has some absolutely stunning imagery. Earth is a beautiful place. Fair warning: this is a commercial announcement. 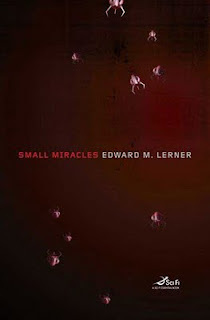 My latest near-future thriller -- this time dealing with medical nanotechnology -- was released on October 13. A new book's release is always exciting, but this release is doubly noteworthy. That's because SMALL MIRACLES is this month's "SCI FI Essential" title. And what is that? "SCI FI has teamed up with Tor Books, the largest publisher of science fiction and fantasy in the world, to spotlight some of the best new science-fiction novels, from both new and established authors.... Each month we select a new book as a SCI FI Essential. That means it deserves to be counted among the finest works of the genre." For the next couple of months I'll be guest blogging at Tor.com. That's a great SFnal website, by the way ... if you haven't yet checked it out, you should. In addition to a large set of bloggers -- many names you'll surely recognize -- the site features first-rate free fiction. For example, Cory Doctorow has a long serial now running. During my guest-blogging stint, I'll continue blogging here at SF and Nonsense -- if not necessarily as often. This morning brings news that the 2009 Nobel Prize for Physics was awarded to Charles K. Kao, Willard S. Boyle, and George E. Smith. Kao was recognized for his work with fiber-optic cables, central to modern digital networks. Boyle and Smith were recognized for their work with charge-coupled devices, the key component of digital cameras. Well deserved recognition, of course. And yet, I'm struck by whom the Royal Swedish Academy of Sciences continues to slight: Nick Holonyak. I last formally studied biology in high school. (No clues will be given how long ago that was.) Lots of memorization. Little in the way of organizing principles. At the time, I didn't find it very interesting. In recent years, though, I've been revisiting biology. It probably didn't hurt that two of my college physics buddies eventually got their PhDs in biophysics. 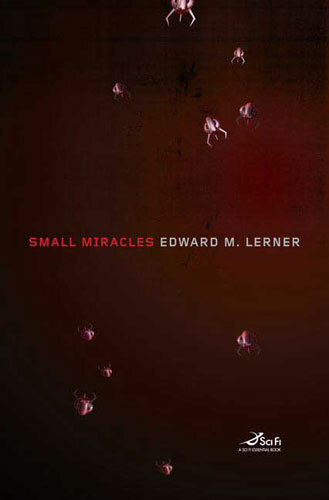 And in the course of reintroducing myself to elements of modern biology, I recently read a book that reexamines cellular and molecular biology with tools very familiar to me as a a physicist and computer guy. The book is An Introduction to Systems Biology: Design Principles of Biological Circuits, by Uri Alon (of the Weitzman Institute). The fascinating theme of this textbook is: straightforward underlying principles drive this complexity. Do the folks organizing the Year of Science not know what a science is? Or do they just not care? Physics is the study of matter and energy and their interactions. 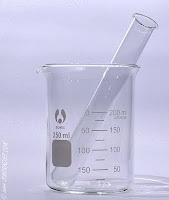 Chemistry is the study of the composition and properties of substances. Biology is the study of living organisms. (Don't ask me to draw precise boundaries between physics, physical chemistry, and molecular biology.) Ecology is the study of the interrelations between living organisms and their environment. What you don't see in any of those definitions is a value judgment. This month's YoS theme is Biodiversity and Conservation. Is anything wrong with preservation and efficiency? No (at least within limits). But this month's theme is about what to DO with nature, not how stuff in nature WORKS. What goes beyond a reasonable limit? One extreme approach toward maintaining biodiversity (NOT suggested by the YoS folks) is the voluntary human extinction movement. That values conservation of every species but one: us. My other gripe with this month's theme is that "conservation" sometimes masks a retreat from the notion of progress. Take eliminating the smogs that once blighted London and Los Angeles. Progress -- better ways of generating power; catalytic converters; more efficient auto engines -- had at least as much to do with that happy outcome as conservation -- driving fewer miles. A note to YoS organizers: if it's not too late, let's talk about ... science. As I obviously believe nanotech is for real, why am I using the trope subject line? In that recent post, I cited the industry's road map, from nanomaterials to nanocomponents to functional nanosystems, all the way to scaled, atomically precise, productive nanosystem array systems. The trope possibility comes from the word you did not see: replicator. Replicator, of course, is the SFnal term for things that copy themselves -- for plot purposes, generally without limit. They come from an idea in K. Eric Drexler's Engines of Creation, which popularized the notion of nanotech. Drexler discussed nanomachines called assemblers that would (duh!) assemble other machines, including -- and here is where the madness begins -- machines like themselves. Nanotech a trope? Say it ain't so! In fact, I'm not saying that. Nanotech is quite real, an up-and-coming revolution in how we will build most everything. Last year I said that in a lot more detail in two science articles, "Follow the Nanobrick Road" in Analog and "The Old Gray Goo, It Aint't What It Used to Be" in the The Bulletin of the Science Fiction and Fantasy Writers of America. Both articles resulted from my attendance at a 2007 conference, Productive Nanosystems: Launching the Technology Roadmap. I was at the conference merely as a journalist (and multitasking by gathering research for a future book). If you want to know much more, here's a link to the 200-page overview pdf. (not my term -- it's way too clunky) scaled, atomically precise, productive nanosystem array systems (swarms of nanoscale manufacturing devices that cooperate to build macroscale objects). A few days after the fact, I have copies of Fools' Experiments -- the mass-market paperback re-release -- in hand. Liking what Tor Books did with the new cover, I'll let it speak for itself. One year ago today I made my first blog post. And while the traditional U.S. first-year anniversary theme is paper -- hardly apt for a blog! -- the modern theme is clocks. So let's look at what's happened over time. In the blog's first year, I've posted 87 times. Which topics most interested you, the readers? That, it turns out, is hard to determine. The free version of Sitemeter -- fairly enough -- offers only limited statistics. And Sitemeter doesn't count all traffic: it misses, for examples, views of cached web pages and via many blog readers. Sitemeter misses, in particular, views of syndicated blog copies. For about two months this blog was featured at Analog and Asimov's web sites. The blog remains syndicated on an ongoing basis through Amazon.com. When readers arrive at the blog's front page, does that indicate interest in the most recent story or a routine drop-in? How does one compare topics that generate lots of reader comments with topics that get a lot of views? How does one contrast onetime topics with ongoing themes? That'll be input to -- but not controlling of -- future posts. Thank you all for clicking in, commenting, cross-linking, and emailing. I appreciate your interest over the past year and look forward to continuing the dialogue. An anniversary toast: to more SF and Nonsense. But it's not about me. My sympathies go out to the editors and staff at JBU. They produced a first-rate product and treated their authors with courtesy and respect. They deserved a happier outcome. Sorry, my friends. To succeed, the Launch Pad program must do more than foster correct science in popular culture. The portrayal of that science must also be accessible and interesting. That's why, besides a pure science track, the program also deals with how to include science in stories. And that led one day to the roomful of authors discussing the dreaded exposition monster. Exposition? That's conveying important background information to the reader. SF critics and editors pan exposition mercilessly, deriding it as an "infodump." SF authors have become gun-shy about the technique. Exposition can, to be sure, be done badly. The exemplar / strawman is the "As you know, Bob ..." digression, wherein one character breaks from the story to tell the reader, in the guise of conversation with another character, what both characters already know. Nearly as cliched is the expert/novice pairing. Here, the expert character lectures an uninformed character (such as a reporter, politician, or a charming but clueless love interest) whose main purpose is to be ignorant -- in the interest of eliciting such lectures. So yes, exposition can be done badly. That doesn't mean it can't be done well, or that readers universally object. Some Launch Pad authors (I among them) argued that exposition has its place. The alternatives -- dribbling out the information over the course of a story, or assuming knowledge on the part of the reader, or hinting rather than telling -- aren't necessarily better. James Michener sold more than a few books, and he could start with, for example, the geological processes that formed Hawaii. Tom Clancy sells fairly well, too, with his share of digressions on the history and operation of (choose your weapon system). Westerns paint detailed pictures of the West. Historical novels delve lovingly into their backdrop time and place: its origins, class structure, the implements used in daily life, the influence of geography, the social mores ... .
Technothrillers unashamedly discuss new and upcoming technologies. So why does the SF literati like to beat itself up about a few paragraphs of exposition here and there? I really don't know. I'm newly home from a highly enjoyable week in Laramie, Wyoming at Launch Pad, the NASA-funded astronomy program for authors. The Launch Pad mission: improving scientific literary through words and media. It's as though someone doesn't want any more certified-science-free abominations like the recent mini-series Impact perpetrated upon an unsuspecting public. So what's Launch Pad like? Immersion in astronomy, everything from the source of Earth's seasons to the nature of distant quasars. Immersion, too, in the company of fellow authors. Science-centric entertainment, from the stand-up routine of the Science Comedian to the these-are-the-ways-the-world-may-end stylings of bad-astronomy maven Phil Plait. A trip to the Wyoming Infrared Observatory. I learned. I ate/drank. I spent a week with writers and scientists, during the International Year of Astronomy, overlapping the 4oth anniversary of the first moon landing! What SF author could ask for anything more? I've generally resisted ranting about bad science in TV and movies. There's so much, it seems as if complaining has no point. Here's where I would post a spoiler alert -- if only it were possible to spoil this miniseries. In brief: a piece of space junk threatens Earth; brave scientists / plucky heroes must save us all. We've seen it all before, right? As in the late, unlamented Armageddon. The impactor: a piece of a brown dwarf, described as a dead star. Umm, no. A brown dwarf is a failed star, an object that, if a bit larger, would have heated enough from gravitational collapse to start fusion. (Think something like Jupiter, only many times bigger.) Now a piece of a white dwarf or a neutron star would (on this single point) have made sense. Scale of the impactor: about 1.8 Earth masses, but physically tiny. Despite its mass, it hid in a swarm of meteors. No one noticed any gravitational effect on the meteors (or the planets)? Hel-lo? How round is round? The tallest feature on Earth, Mount Everest, stands 29,029 feet (about 5.5 miles) above sea level. Earth itself is about 8,000 miles in diameter. So: Everest represents less than 0.1% deviation from roundness.) The impactor isn't called a planet, but it masses more than Earth, which IS. Why isn't the impactor round? Impactor's effects: The object embeds itself in the moon -- giving the combined body a mass of about two Earths. The resulting object will soon crash into Earth. It's mentioned the (unaltered) moon has a mass of 1/6 Earth. No! The moon has a mass 1/81 of Earth, and -- because of its smaller radius -- a surface gravity of 1/6 Earth. Moon plus very dense impactor would have a *very* high surface gravity, the exact number depending on how deeply the impactor embedded itself, and where on the surface (how near the embedded mass) one measures. In any case, *many* times Earth's gravity. So when, inevitably, our plucky heroes go to the moon -- the solution they implement there too handwaving to bear describing -- they should be crushed flat. I could go on, but I won't (and you're welcome). The "science" was simply appallingly awful. One can only shake one's head at this miniseries airing (June 22nd and 29th) so close to the 40th anniversary of the Apollo 11 moon landing (July 20). Woohoo! July's theme for the Year of Science is astronomy. Astronomy is arguably the mother of sciences. Looking at the sky, and measuring and recording what is there to be seen, is very old. It goes back to Egypt and Babylonia (and other early civilizations, no doubt). The early predictions -- the timing of the Nile floods, say -- could be utilitarian; they were no less scientific for that. And the recording could be cumbersome -- such as, perhaps, Stonehenge, plausibly a big calculator of the seasons. Still: astronomy. Certainly astronomy was my first science. I had a 3-inch telescope as a little kid. Even before that, I sometimes borrowed my dad's binocs to look at the moon. 2009 is the International Year of Astronomy, marking 400 years since Galileo first used a telescope to study objects in the sky. It continues to amaze me how much, and how often, astronomers have recast our understanding of the universe and humanity's place in the universe. From Earth-centrism to heliocentrism. From heliocentrism to a place in the fringes of the galaxy. From humans living in the one all-encompassing sea of stars, to living in one of the many galaxies in a far grander universe. From living in a static universe to knowing that the universe is forever rushing apart. Along the way, the human urge to know more about the sky has inspired amazing technologies, from single huge radio-astronomy antennae like the Green Bank Telescope, to arrays of radio telescopes, to the Hubble space telescope, to the SOHO spacecraft at the L1 Lagrange point, to an ever-increasing cadre of robotic explorers. Some people look at the night sky and come away with a sense of their own insignificance. I look at it, and think how much we have learned, and come away inspired. Q: How do you describe Juggler of Worlds ? A: Juggler shows what happens when a paranoid government agent really does confront vast alien conspiracies. Sigmund Ausfaller comes by his paranoia honestly. He was ten when his parents disappeared amid a conflict with the Kzinti—and everyone knows the Kzinti eat their prey. He grew up to watch aliens for a living. It’s up to Sigmund to make sense of things when the super-secretive Puppeteers, who have made worlds and species across Known Space dependent on Puppeteer technology, suddenly disappear. The Puppeteers had good reasons to hide. The last thing they want is Sigmund bringing the military might of the human worlds down upon their heads (of which each Puppeteer has two). It’s left to the Puppeteer operative known as Nessus to somehow keep humanity at bay. Puppeteers being philosophical cowards, they’re generally incapable of leaving home. Nessus can, and that makes him insane in his own way. Q: Sigmund Ausfaller. Nessus. Don’t I know those names? A: If you’re a Niven fan, then yes. Sigmund played minor but pivotal roles in two of Larry’s early, award-winning stories (“Neutron Star” and “The Borderland of Sol”). Nessus most prominently figures in what is perhaps Larry’s best-known novel, Ringworld. 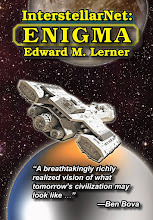 More than any other reason, the book came about because I felt Sigmund had leading-man potential and unique insight into the panorama that is Known Space. Q: Juggler sounds like some kind of secret history. I’m reminded of the Ender’s Shadow books, which parallel Ender’s Game and its sequels. A: Exactly! Events in some of Larry’s stories that seemed independent or random or coincidental … aren’t. Sigmund and Nessus—and their interstellar game of cat-and-mouse—lie behind much that readers thought they understood about Known Space. Our model was the Tom Stoppard play Rosencrantz and Guildenstern are Dead. While Rosencrantz and Guildenstern are hangers-on at the Danish court and minor players in Hamlet, they are, of course, the central characters of their own play. Wherever Stoppard revisits a scene from Hamlet, some dialogue repeats—interspersed with muttered asides and interior monologue Shakespeare never imagined. Unless you’ve memorized Hamlet, it’s hard to know where Shakespeare leaves off and Stoppard begins—yet much of the Stoppard play happens aboard a ship far from the Danish court! Juggler interleaves events old and new, and occasionally dialogue, in the same way. Q: Then Juggler overlaps chronologically with some of Larry’s stories and with your earlier collaboration, Fleet of Worlds . A: To get away from the theater metaphors, Juggler is a mosaic in which other stories are some of the tiles. Events are examined from new points of view. Heretofore unsuspected linkages emerge. Players in past stories are sometimes revealed—by reason of self-interest, nobility, or ignorance—to have told partial truths or been honestly mistaken. It took planning, but we’re happy with how everything fits together. Where we revisit specific circumstances—say, the expedition in “Neutron Star”—it’s always from a different character’s point of view and the event is surrounded by heretofore unsuspected causes and unrevealed consequences. Q: So who is the titular juggler, Nessus or Sigmund? A: We leave that to the reader to decide—fully expecting opinions to change over the course of the book. Q: What’s your next project, Ed? When Brent Cleary was caught in a gas pipeline explosion, it took more than one small miracle to keep him alive. Too bad the small miracles have an agenda of their own…. Q: Thanks, Ed. It was a pleasure talking with you. So when will we have robot servants (like Rosie the maid on the Jetsons)? Probably not this year, but clearly we are getting closer. Already we can get autonomous robotic vacuums and robotic pets. The military, of course, uses teleoperated robots to spy from the sky and to find landmines. Robots -- albeit very specialized -- have long been at work in our factories. Eons ago, when I started work on my computer science MS, to make a robot that could recognize and react properly to its environment was a huge problem -- PhD dissertation material. I shared an office with a guy whose PhD thesis involved a robot able to stack blocks. Not only was his robot physically huge, its questionable ability to model the real world necessitated that it move at a snail's pace for safety. Now undergrads do robotics projects far more sophisticated than anything dreamed of by my office mate. See this article and its YouTube video, in which many of the robots are undergraduate projects. Watch the bots sense and react to their environments. The maze-following robot in the video struck a chord with me. The artificial life in my novel Fools' Experiments was purposefully evolved by solving ever more elaborate mazes, involving progressively more dimensions and complex geometries. Alas, my robot won't be here soon enough to spare me unloading the dishwasher. The Year of Science returns, this month to celebrate The Ocean and Water. I'm underwhelmed again this month. The Earth's surface is mostly water. Our cells are mostly water. Tell me something I didn't know in third grade (a long time ago). How is trafficking in the trite supposed to get anyone excited about science? Peeking ahead to July, though, we have astronomy. Yea! Naturally I posted about Juggler when it originally came out, and my website has a sampling of the rave reviews. But the proof of the book is in the reading, and so courtesy of the publisher here is an excerpt. At least I find this time-travel story to be très drôle. I posted in April that one of my favorite short stories, "Grandpa?" -- already a short film and having just come out as a podcast -- had achieved a multimedia trifecta (that post here). That recent podcast led directly to a new first for me: my first movie remake. After hearing the podcast, Three Letter Agency (aka, visual effects artist Matthew Lane-Smith) contacted me. TLA has now optioned "Grandpa?" for a new short film. This post started out with another subtitle: unknowable. Then -- a dangerous habit, to be sure -- I started to think. This series of posts began in advocacy for *alien* aliens, as opposed to the human-in-rubber-suit aliens too common in (especially) TV SF. Certainly, you're thinking, aliens so different as to defy human understanding qualify. The Eschaton series by Charlie Stross (disclosure: I've read only the first book, Singularity Sky). "Eschaton" is the end of everything, the ultimate destiny of the universe. The fictional Eschaton is an AI so advanced no one can comprehend its thinking. The Buggers/Formics of Ender's Game. Humanity and this insectoid/hive species fight a battle of extinction because humans and aliens cannot communicate. Humans cannot even convince the aliens we are capable of communication. The creatures of the Beyond, in Vernor Vinge's Zones of Thought novels, most notably A Fire Upon the Deep. 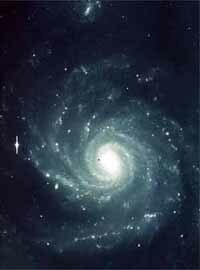 The farther one travels from the galactic core, the deeper mentality becomes. Beings of the Beyond may strike us as good or evil, but their capabilities and motivations are unknowable. 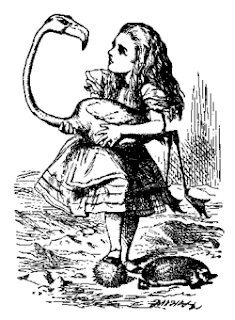 On due reflection, I decided unknowable aliens in fiction are nothing new. They're devices to move forward a plot involving beings we can understand: humans. Lots of fiction uses such devices -- items we don't understand but to which the characters must react. The Maltese falcon is one in the movie of the same name. Ditto the metal briefcase in the movie Ronin. Alfred Hitchcock called the device a Macguffin. Once the story gets underway, you forget to wonder what the MacGuffin really is. So: in Singularity Sky, we deal with the Eschaton's human agents -- them, we understand. In A Fire Upon the Deep, a Beyond being chases some characters into slow-witted parts of the galaxy, where readers encounter (wonderful) aliens we can understand. Buggers are a more complicated case. Throughout Ender's Game (the first book of a series, in fact two interlocking series) the Buggers are unknowable. In later books the hive queens suddenly have telepathic linkages with selected humans. The *human* story has progressed, and now the storyteller needs to establish a connection with the aliens -- and that required destrangifying (like that word?) the alien. Might the universe have aliens so different from humans we'll never understand them? I don't see why not. But unknowable aliens in fiction generally aren't really unknowable, they're props. Tools of the authorial trade. MacGuffins. NASA leadership may have agreed to the latest Hubble repair mission only under popular pressure, but now that the repair has happened -- well, wow! Kudos to all involved. The HST, a great national treasure, has had its life extended and its value enhanced yet again. And doing so required -- people in space. No robot yet devised has the strength, dexterity, improvisational skills, and mobility to match what the latest repairmen brought to the orbiting observatory. Now what does ESA plan to do when either Planck or Hershel, both on their way to separate halo orbits around the Earth/moon L2 point, develops a glitch? Oh, to be able to travel farther than we could in 1968. May's theme for the Year of Science is "Celebrate sustainability and the environment." To which, for the first time in the YoS program, I say: Bah. And: Faugh. And: How disappointing. Wait a bit on the torches and pitchforks. By all means, let's study how the environment works. Heck, we live in it. And wouldn't it be great if we came to understand how to build a stable biosphere. It'd be handy for, say, long-term spaceflight or establishing off-world colonies. And certainly I have no quarrel with efficiency. That's no reason to make a goal of "sustainability." I find sustainability fatalistic and inward looking, lacking in ambition. Whether I put on my technologist hat or my SFnal specs, I have to ask: why should our aims -- and our imagination -- be so limited? There's an entire UNIVERSE out there. Why isn't our ambition to tap a few off-Earth resources? Why don't we consider moving the dirtiest industries someplace -- in orbit a thousand miles up, say, or on the moon -- where sunlight is unfiltered by atmosphere and unaffected by weather? Someplace where pollution won't matter? Why don't we think about moving out to the moon, and Mars, and the Belt? The universe, presumably, is a zero-sum game. But one tiny planet? We're nearing the level of technology at which Earth limits us only if we let it. To me, sustainability is less about science than it is a mass movement. And the sad thing about sustainability as a goal, and about those situations where environmentalism becomes religion or politics, is that once we lower our sights it becomes all to easy to forget how to raise them. I've read Analog since roughly forever. My first published fiction (a short story called "What a Piece of Work Is Man") appeared in Analog. While my short fiction appears in many markets, more has appeared in Analog than in any other venue. So I was delighted to get my July/August issue (yes, I know it's early May -- but who better than an SF mag to use a time machine?) and find myself named in the Analytical Laboratory. (For you non-Analogians, that's the annual readers' poll). More specifically, my novelette "The Night of the RFIDs" was the reader-ranked second-best novelette of 2008. Not coincidentally, I suspect, my Analog science article, "Beyond This Point Be RFIDs," was a finalist in 2007. Having concluded that article with a few paragraphs about the SFnal implications of RFID technology, I took one of them for myself. Swine flu (or whatever is the preferred name for the disease today) is a serious matter. Some have died; more have been sickened. For them and their family statistics hardly matter. Again according to the CDC, about 80 people in the US die annually from lightning. I don't know about you, but to me the swine-flu coverage (and concern) seems more than a little disproportionate. As an exercise in sociology, press and government reaction to the outbreak is fascinating. As public policy ... ugh. I find myself a bit talked out. Maybe that shouldn't surprise me. The stats show more than sixty posts over the past eight months. Rather than post because it's been a few days -- and not because I have something new to say -- I'm going to pause for a bit. But don't let that stop YOU. Are there science, technology, or SFnal topics you'd like discussed? Comment away. You might just restart my blogging juices. Flash fiction -- stories no longer than a few pages -- is one of my authorial vices. Why a vice? Because the shorter the story, the more effort each paragraph, each sentence, each word takes. Short stories are labors of love or necessity: compulsions demanding that they be set to paper. Short stories are seldom, in any financial sense, worth the opportunity cost -- the time spent writing them. Flash fiction, being especially brief, takes special care. More than merely serve a purpose, each word must be essential. (Death to adverbs! Less is more!) The reward? Whether it serves up a punch line or an epiphany, a piece of flash fiction has an out-sized impact. My flash pieces have appeared in Analog more than any other venue. One such story -- and a favorite of mine -- is "Grandpa?". It deals with the (in)famous grandfather paradox of time travel. A few days ago, "Grandpa?" made its third appearance, this time as a free podcast at Escapepod. Reader Ben Phillips did the story proud -- again.